You may have been led to believe that building a home studio, becoming a famous musician on Youtube marks the end of the journey and you can gladly rest happy with the Youtube monetization from your songs. In real life, becoming famous is just your first step. Then, you need to really introduce yourself to the audience through live performances. And here comes the tricky part. No matter the music genre, no matter the style or the quality of your voice, you will have to buy a great set of wireless microphones. They will capture the acoustic signal of your voice and it will transmit it to the sound system without the need for cables. Although many artists love wired mics, they still need to have a set of wireless microphones in your gear box. The most important thing about them is that they allow the singer to move freely on stage, to better interact with the audience. Coremic recommends this solution for all situations where cables could hamper the smooth running of the live show. These types of mics are especially recommended for dynamic singers that are all about dancing and moving around. In order for you to identify the right wireless microphone model that’s suited for your live show, you need to understand few things about these mics. It’s not all about the budget, sometimes there are few characteristics that need to be taken into consideration. When it comes to wireless mics, you will find both handheld devices and lavalier microphones on the market. 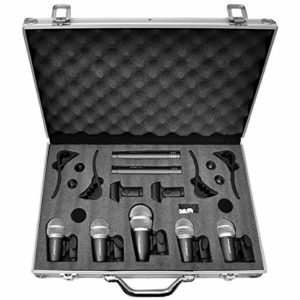 The second category encompasses several alternatives: conventional mics, headphones and instrument mounts. Also, there are “variations” of these mics when we are talking about a wireless microphone for a video camera or a spy. But we do not recommend a lavalier mic for live vocal performance. The handheld microphone is ideal for musical performances and parties. It is used very often at weddings and it should be part of the equipment kit for any place where concerts or events are organized. A conventional wireless set consists of the microphone and a wireless receiver that connects to the sound system. A lavalier wireless microphone is usually preferred for talk shows, stage theater, presentations, and public discourse. The kit consists of a microphone and a transmitter, linked together by wire. The transmitter is as small as possible and it will be secured in a pocket or belt. The headset microphone is derived from the lavalier and it is the perfect solution for artists who sing and dance at the same time on the stage, allowing them unlimited movements and hands free. This particular setup features a transmitter that attaches to the body, which will send the signal to a specific receiver that is connected to the main audio system. For musical instruments (for example, a wireless microphone for saxophone or accordion), a kit similar to the lavalier is used. In this case, the transmitter is worn by the instructor, and the sound receiver is attached to the musical instrument. The transmitter unit will take the signal from the microphone and send it wirelessly to the sound amplifier. If we talk about a wireless spy microphone, we are talking about localized interception models that are placed in the place where the sound is picked up and can be accessed via the SIM, based on a simple phone call. The lavalier parts with a wireless receiver compatible with the camcorder interface can easily transmit the acoustic signal. You can choose between unidirectional and omni-directional wireless devices. What is the difference? The first one picks up the sound from one direction, and the second one can receive it from any direction. Each type will have its advantages and disadvantages. For example, in a conference room or an amphitheater, a one-way microphone will be the perfect solution. The most important disadvantage of the unidirectional mics is the fact that they can interfere with other microphones, with other electronic devices. There is also the “proximity”, which means that the sensitivity of the device is significantly increased if it is too close to the sound source (the mouth). Omnidirectional mics are usually recommended for concerts that have great sound systems, where they can pick up signals from instrument clusters or vocal choirs. You should know that unwanted sounds can infiltrate here, with sound channels interfering. There are two modes of operation and transmission: analog (VHF or UHF) and wireless digital. The analog transmission can be on high frequency (VHF – ranging from 174 to 216MHz) or ultra-high frequency (UHF from 470 to 805MHz). The latter is suitable for high end purposes. This is due to the fact that the signal radius is more extensive in the UHF, and the number of frequencies available will be much higher. The problem with the analog signal is always the risk of interference. With this particular problem in mind, many musicians are looking for opinions and alternatives. When it comes to digital wireless microphones, the analog signal is converted to digital and it uses a transmitter to send the signal and a receiver to receive and decoded the signal. The risk of radio interference with these types of microphones is zero. However, it can be argued that a high performance analog UHF device will be as good or even better than a digital wireless mic. It is time to mention the transmission distance, the frequency response, signal / noise ratio and power supply mode. For medium-sized rooms, the transmission must be effective up to about 30 meters. 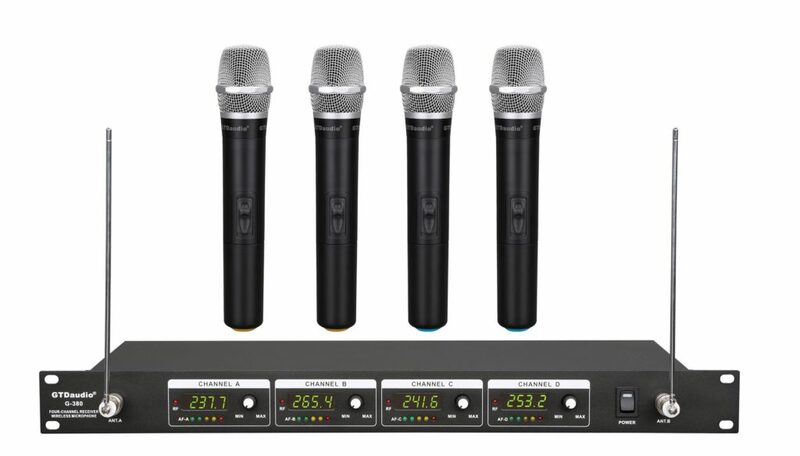 For smaller rooms you can choose mics with 10 meter transmission distance. As with any device that works with an acoustic signal, the frequency response for microphones must be adequate, with values of about 100Hz – 10000Hz. As a signal-to-noise ratio, the value is expressed in decibels and it should be as high as possible, thus indicating that the sound is clearly perceived by the microphone. 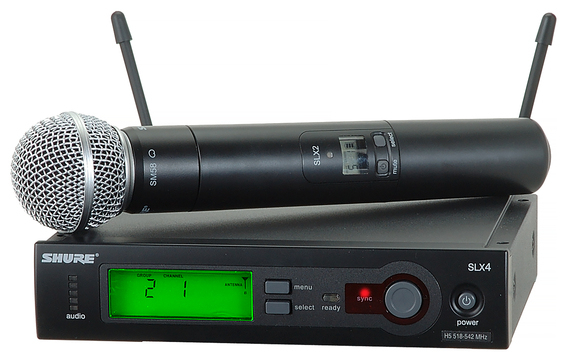 Conventional wireless mics feature values below 30dB, while the semi-professional equipment offers values around 60dB. It goes without saying that, for a professional wireless microphone, these values will easily exceed 60dB. Most products require batteries to function properly and it would be helpful to check battery compatibility before buying. Getting the best wireless mic for your gig is not an easy job, and it depends on many factors. Even so, we have decided to provide a list with the best wireless microphones that we like. While compiling this list, we have taken into consideration the quality of the device, its reviews, its price and its overall performance. If you are looking for wireless mics, we strongly recommend for you to start your search on major online stores. This way, you will get a chance to learn about all the features and prices for each mic, you can see the user feedback and you can get great discounts (if you are lucky). 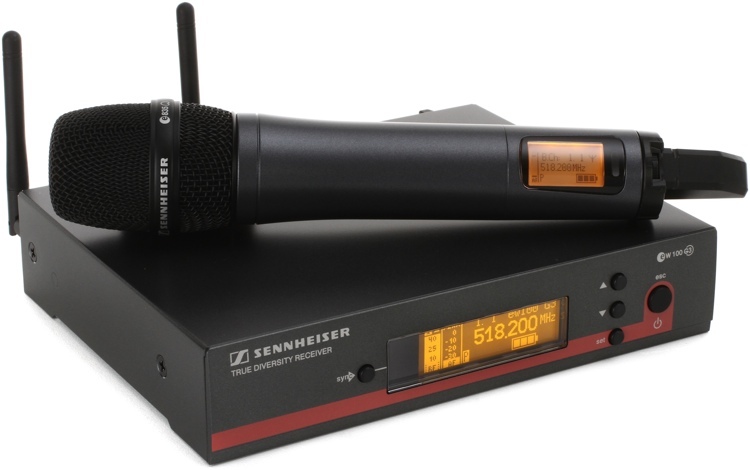 In terms of brands, we recommend Sennheiser, Behringer, Shure or Sony wireless microphone. If you are on a tight budget, you will be able to find lower prices from less well-known brands. This microphone is probably the Godfather of live mics that proved itself to be the inspired choice for many artists. Shure has been building great dynamic mics for a while now, and their SLX2/SM58 is definitely one of their accomplishments. The SLX wireless mic allows automatic synchronization thanks to the incorporated ‘Audio Reference compounding technology’. 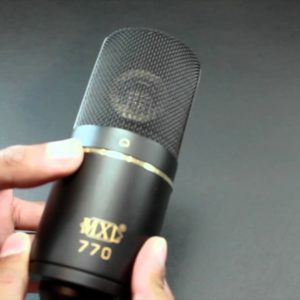 This mic was specifically tailored for vocals, with a brightened midrange and bass rolloff. 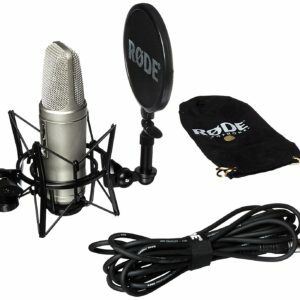 Also, there is the pneumatic shock-mount and pop filter that cuts down the handling noise. The frequency response is between 50 and 15,000 Hz and -54.5 dBV/Pa. If you decide to buy this UHF microphone, you will learn that the box contains the rack mount receiver, the hand-held transmitter, the power adapter and antennas. The mic offers automatic frequency scan (42 MHz — 1680 MHz tunable UHF frequencies), a sturdy metal housing and high quality reception. 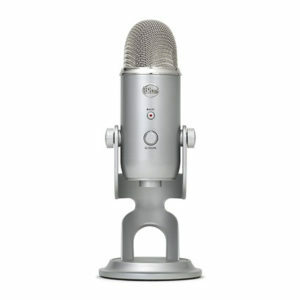 It features the HDX compander that offers crystal-clear sound voice capture and it is equipped with the famous e835 cardioid dynamic capsule. The receiver offers an equalizer that might come in handy for some of you. Let me start by saying that this is the best wireless microphone that you can buy on a low budget (under $40). The box contains two wireless mics and a receiver. Each mic is color coded (green and orange). Reading through the specs, you will learn that it has a frequency response of 60Hz~12KHz and operation range between 50 and 150 meters. The signal to noise ratio is 80dB. This setup is recommended for bands with multiple singers. It contains a r channel receiver with 4 microphones. You will be able to use this one at 230 feet distance, which is more than enough. GTD Audio G-380H is a semi-professional model whose technical characteristics demonstrate that it delivers sound to the highest standards. It uses the VHF frequency for sound transmission at a fixed frequency. It has a signal-to-noise ratio of more than 90dB, which means clear acoustic fidelity. It can be used with a 12V power source, but it also works with an AC adapter. It can also be used as a wired microphone. The model is dynamic, meaning that it can capture sound from powerful sources and will not make any noise when it’s handled (useful for vocalists). The market is packed with all kind of offers and prices. 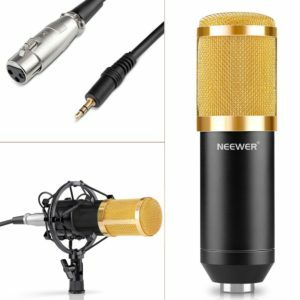 These are just few of the mics that we love, and we invite you to scout all the prices, read all the reviews and choose a wireless microphone (or a set of wireless microphones) that fits your needs and your budget. 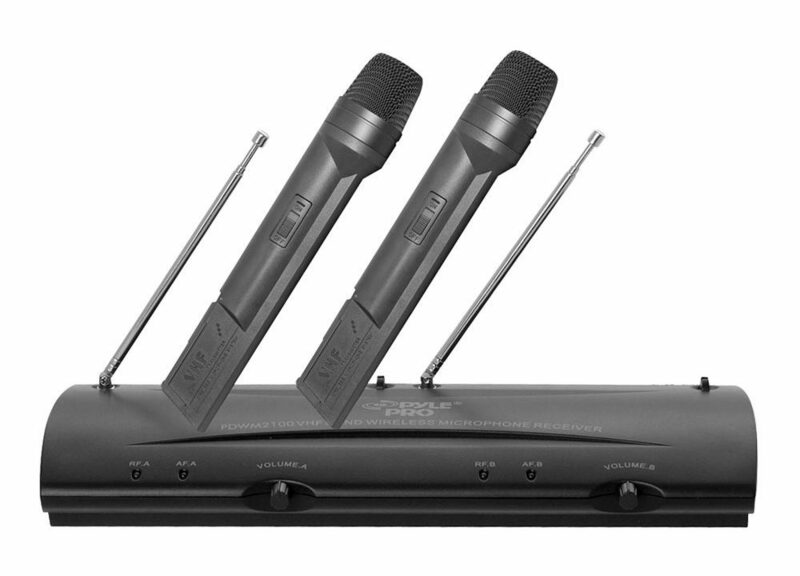 Which is your favorite wireless microphone?